There’s a certain magic to academic competitions. Debate teams and Academic Decathlon members understand the focus and determination it takes to stand in front of judges and face what can be one of an adolescent’s biggest fears: losing. Unlike the comfort one can experience in these team activities, there is a competition where the pressure is all on a sole individual and he or she alone determines the outcome of the competition, where remembering that “I” comes before “E” except after “C” (in most cases) can be the difference between winning a juice box or going home with a trophy. 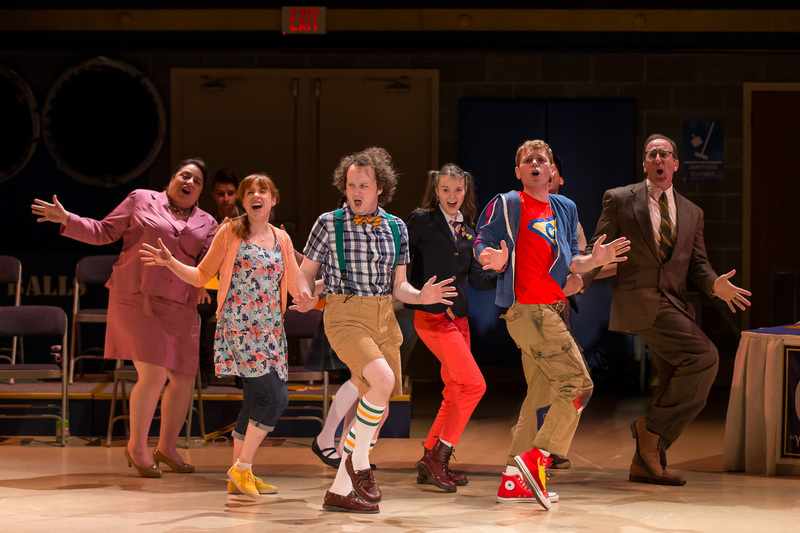 This, of course, is the basis for “The 25th Annual Putnam County Spelling Bee,” now playing at Drury Lane Theatre. The cast of spellers is hilariously brought to life by Eli Branson (William Barfée, who spells with his magic foot), Carolyn Braver (Logainne Schwartzandgrubenniere, a girl who wants to win so America will love her and her two dads will be proud), Zack Colonna (Leaf Coneybear, who makes his own clothes and wears a cape made out of a shower curtain), Jordan DeLeon (Chip Tolentino, last year’s Spelling Bee champ), Landree Flemming (Olive Ostrovski, a girl who believes her dictionary is her best friend), and Stephenie Soohyun Park (Marcy Park, a perfectionist who wants to prove she can be okay with being imperfect). The wonderful cast is completed by Johnathan Butler-Duplessis (Mitch Mahoney, the Bee’s “comfort counselor), Joe Dempsey (Douglas Panch, the vice principal of the local junior high school) and Frances Limoncelli (Rona Lisa Peretti, a local real estate agent who won the 3rd annual Putnam County Spelling Bee). The pre-show music is set to tunes that have spelling as a main component—i.e. “RESPECT,” “ABC,” and “L-O-V-E.” The set, designed by Jeff Kmiec, is a great representation of a well-kept school gym, complete with a scoreboard that counts down the minutes until showtime. Prior to entering the theater, audience members can opt to become a part of the show by registering for the bee. Four audience members are selected each night to join the competition, but, just like with the cast, they must follow the rules of the bee or they are eliminated. Drury Lane Theatre, 100 Drury Lane, Oakbrook Terrace, (630)530-0111, drurylane.com. $40-$50. Through August 17.